Jules was amazing, informative and engaging! Small Group was perfect-met two new friends (Pauline and Tony)! It was spectacular to see authentic English towns instead of the commercialized areas. Really enjoyed!! In fact this was one of our favorite parts of our entire trip!! Highly recommend!! Jules was an excellent informative and friendly guy. The trip was so much more than we expected. Small group made the day even better. We had a really great day with Jules. So knowledgeable and helpful. From the start to the end was filled with adventures. The Day tour with Jules was fantastic. He was so cheerful to be with and his knowledge of British history was excellent. The perfect day tour around the countryside surroundings of Bath for our short visit. Thank you! We truly enjoyed our small group tour of Stonehenge and Authentic England from Bath. 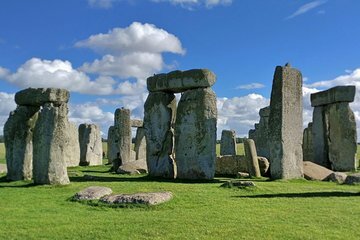 Having a guide who was able to educate our small group on the mysteries of Stonehenge, as well as immerse us in beautiful and historical village life was priceless. Jules is such a personable guy, that by the end of the tour we all felt like friends. We also really appreciated his visual and even audio resources. You can tell he has a teaching background! Thanks Jules for a great day. We will recommend you to all our friends traveling thru Bath. Jules, We just can't thank you enough it's been 3 weeks since the tour and we are still talking about you. Your tour was the highlight of our entire 3 week trip. Stonehenge was a bucket list for The Grandparents however we were looking for something we as a family hadn't done. So the secrets of Somerset was intriguing and we are so happy we did the tour. Jules tied in so many neat stories and history lessons to all the different places we visited it was amazing. I apologize I'm being deliberately vague so I don't give away any secrets. His teaching background really comes thru especially in his desire to accommodate for everyone. One of our 3 sons is Autistic and can be very distracting but Jules never missed a beat and was very engaging to everyone. Thanks again Jules we wish you a happy and prosperous new year!